When choosing a bicycle for riding around town, the features that a bicycle has (or lacks) can make a difference in the convenience and comfort of your ride. Find out what makes an ideal bicycle for commuting before making a purchase decision so you can get to where you need to go. When I started bicycle commuting, I used a bike that I had from when I raced road bikes and rode for training and endurance. My bike was designed for competitive cycling, not necessarily for commuting to work. I wore specific shoes that snapped into the pedals and special clothing designed to work with the seat installed on my bike. This meant that I needed to change clothing after I arrived at the office and change again for the ride home. I quickly learned that what I really needed was a bicycle designed for commuting to better fit my needs of transporting myself and the stuff I carried on a daily basis. So I went into our local bike shop and they helped me find my daily commuter ride. Since then, my bike and I have been inseparable!! Here are some things you may want to look for when searching for a bicycle to get around town. 1. STYLE: Choose a city, comfort or touring bicycle. 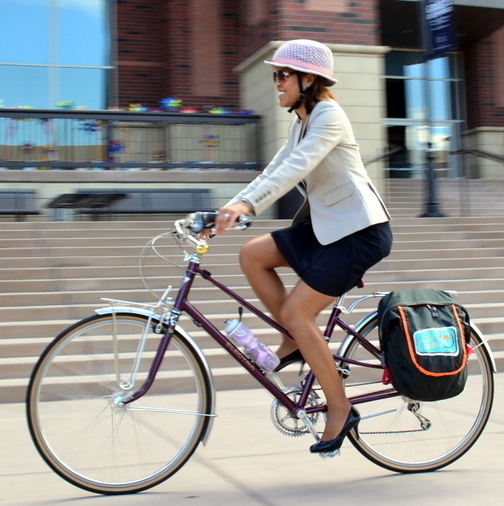 The style of bike like this Papillionaire Mixte will dictate how you travel and what you can wear. The low top tube of this step-through frame makes it easier to get on and off the bike without needing to swing your legs up high. Especially if you're wearing a skirt or have limited hip movement. 2. GEARS: Help you go uphill, downhill and faster on flats. The gearing on a bicycle (for example a single speed or multi-speed) you need depends on whether you live in a place where the roads are flat or hilly and the steepness of those hills. 3. FENDERS: Protect your clothing. Fenders shield your clothing from road grime and from being splashed by mud or water from irrigation run-off. 5. OTHER CONSIDERATIONS: A chainguard to protect your pant leg. It is not possible for all bikes to have a chainguard, but it will help to protect your pant leg from grease marks or getting caught in the chainring. 4. RACK: To carry your stuff. A rack offers a way to carry your things in panniers or baskets and lets your bike take the load off your back. 5. OTHER CONSIDERATIONS: A kickstand. A good strong kick stand is nice to have which will help your bike stand up on its own. The style of the bike will dictate how you travel and what you can wear. There are many, many styles of bikes and they work well for what they are designed for. For example, road bikes are for going fast on pavement and mountain bikes better for riding on dirt, rocky trails or gravel roads. Could you ride a road bike or mountain bike as a commuter? Of course you can! But without swapping pedals or tires or adding racks and fenders, the bike may not be as functional or comfortable as a city, comfort, or touring bike -- which is what I recommend if you plan to use your bike to run errands, grab coffee or lunch with friends or ride to work. Dutch style city bikes such as the Papillionaire "Sommer" with its swooping step-through frame is also a good option. Above all things -- you have to LOVE, LOVE your bike or else you will not ride it. So pick a bike that you like the looks of! Depending on where you live, you may or may not need more than one gear. If the terrain is flat like Florida, a single-speed bicycle will work. If there are many hills along your route, like where I live, having more gears will be helpful. Additional gears can ease your pedaling comfort and effort when riding uphill or downhill, and give you more speed on a flat road. For example, a 3-speed is perfect for mild to intermediate hills so you can get some assistance going up or down hills. An 8-speed is ideal for more challenging commutes to handle more difficult inclines and for greater power on downhill and flat gradients. I ride a 20-speed and it comes in handy near the end of my 10-mile commute when I'm riding up a mile-long hill with 5% to 9% grades. Fenders aren't just for rain. Front and rear fenders protect your bike and your clothing from grit and grime when the roads are wet from irrigation run off and puddles. While you can add fenders to your bike, try to find a bike that comes with fenders that are factory installed. They tend to look and fit better. You may only need a purse or a messenger bag to carry your stuff around in. But if you plan to carry A LOT of things with you (like we women tend to do) and/or for distances longer than 3 miles, then you really need a bike with racks to support panniers or baskets. Unlike a car, there's not an extra seat or trunk on a bicycle to carry your stuff. You will need a way to bring the things you need with you on your bike. On a given day, I have with me my bike lock, flat tire kit, lunch, rain jacket, tablet, books, wallet, keys, phone, etc. I may stop at the grocery store on the way home to pick up wine, fresh fruit and vegetables and boy am I glad to have a rack and pannier system instead of having to haul the goods home hanging off my arms or on my back. KICKSTAND: A kickstand helps your bike to stand up on its own so you can be hands-free to do other things like loading up the rack or getting things in and out of your tool bag without having to lay down your bike when you don't something to lean it up against. CHAIN GUARD: It is not possible for all bikes to have a chain guard but it will protect your bike from grease marks or getting caught in the chainring. If your bike doesn't have a chain ring, you can always use a trouser strap like these Brooks Leather Trouser Straps, tuck your pant leg into your sock or boot., or fold and roll up the material. SADDLE: Your seat (or saddle) should also be comfortable since you will not be wearing special cycling shorts with padding. A "comfortable" saddle does not necessarily mean lots of padding. Personally, I prefer a firm seat. Many women believe that a minimal saddle would hurt and it needs lots of padding to be comfortable but that is not true. If the saddle is the correct width and fits you well, it will perch you up and support you by your sit bones. I have picked out a few styles of Brooks Leather Saddles in the Cuter Commuter Shop for you! For all of these reasons above, we chose to carry Papillionaire Bicycles in our Cuter Commuter shop because it has the features that make an ideal commuter bicycle and would be great for riding around town.